My parents are always telling me to read more books. But I just found a better way to read the Ballpark Mysteries: by listening to them! 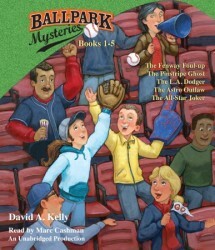 Apparently, there’s a Ballpark Mysteries audiobook collection of books 1 – 5 is coming out June 12th. Now, I won’t have to bother actually flipping the pages and reading them, since I can listen to them instead. Of course, it’s still fun to look at the pictures. Check out this Ballpark Mysteries audiobook sample. Now, if I could only get someone to do my homework….